Hand spraying fruit tress was a labour intensive process. It was generally done using hand held spraying wands with pressurized spray being provided from a mobile tank with petrol engine powered pump, or a network of pressurized spray supply lines in an orchard. Normally an orchard worker would be expected to hand spray 1 to 1.5 acres per day. Post WW2, there was considerable movement of labour from agriculture to manufacturing industries. Shortages of labour were creating major problems for orchardists. Finding labour saving devices was a major focus for horticulture research during this period. Introduction of air blast sprayers and bulk handling of fruit were key labour saving opportunities identified for horticulture industries by Harry Kemp. Harry Kemp was the first Horticulture Research Officer appointed by the Dept of Agriculture in 1936, and continued as the Senior Horticulture Research Officer until 1954. The SA Department of Agriculture played a lead role in introduction of these air blast sprayers to Australia. Between 1946 and 1949, Dr James Marshall of the Summerland Research Station at Penticton in the Okanagan Valley (British Columbia, Canada) developed the “drive by” air blast sprayer for spraying fruit trees and vines. It consisted of a large fan to deliver a 100 mph air blast into trees along with pressure pump, swirl plates and nozzles to give suitable droplet size to be carried onto trees by the air blast. • spraying rates of 8-10 acres per man day were easily achievable with the machine, offering dramatic labour savings. • spraying could be more easily completed in limited periods of fine weather during the critical spring period. By June 1952, local manufacturing of air blast sprayers under license was being explored. 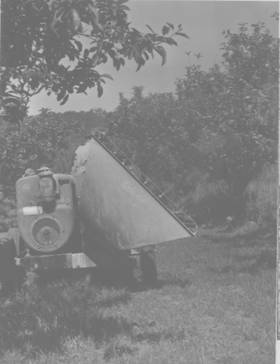 By June 1953, manufacture of air blast sprayers had commenced by two local manufacturers, and they used Blackwood Experimental Orchard as a site for performance assessment of their prototype machines. One of these, Metters Ltd would go on to be a major supplier of this spray equipment across Australia. 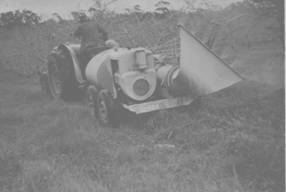 By mid 1953, limited numbers of privately owned air blast sprayers were now in use by Adelaide Hills apple growers. The labour saving benefits and superior performance of air blast sprayers were easily demonstrated to orchardists. Rapid and wide scale adoption of air blast sprayers by orchardists and vignerons occurred through the mid 1950’s. During the mid 1950’s there was considerable work in refining tree coverage, developing spray formulations and recommended application rates for use through air blast sprayers. Much of this work was done by research officer of the time, Lou Campbell Smith at Blackwood Experimental Orchard. There was considerable support from regional horticulture advisory staff and industry personnel in assisting the adoption of air blast sprayers. Data from this trial work was then incorporated into the annual spray charts produced on a district by district basis to foster the adoption of the latest pest and disease management technology. The Department of Agriculture continued long term development of new air assisted spray application technology at Loxton Research centre from the 1970’s until recently. It was done in close cooperation with a range of sprayer manufacturers. This research by Mr Geoff Furness focused on new controlled droplet application nozzles, high volume low air speed fans, new drive and control systems for fans, and improved techniques for tree and vine canopy penetration.